So, Color Club Pure Energy. It was released in the 2009 Electro Candy Collection, though I got mine at Ross in one of their Color Club packs they have on occasion. They always come without a label and since I cannot stand for the polish not to have a name, I added my own label. The formula was thin but not runny. It was streaky the first two coats but by the third it was good. The nail line was not as visible as the picture make it look. As with all neons it dried semi matte. I added top coat to make it shiny. I really like this polish. It's a fun change for me! OPI Thanks So Muchness! from the Alice In Wonderland collection released spring 2010. This is a super popular collection though this color is as popular as Mad As A Hatter and Absolutely Alice. Dusty hunting and blog sales are about the only way you will find these any more. Occasionally on ebay as well. Expect to pay a lot if you get them other than dusty hunting. OPI Thanks So Muchness! 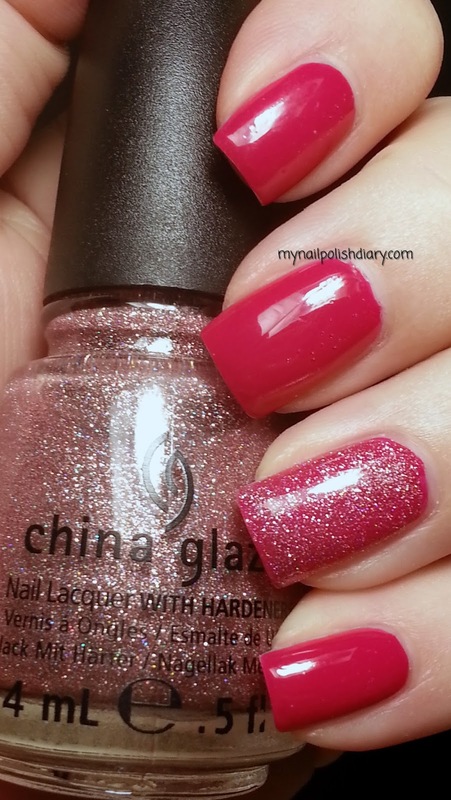 is a medium red shimmer with small pink flakes. The flakes are subtle but when the light hits them just right they're awesome. I like that about this polish. It's like a little here and there. Super fun. Application was ok, it's a little thin, but didn't pool in my cuticles. I was pretty careful though. Wear time is great. I love that I got this whole collection. It's a gorgeous collector's collection. 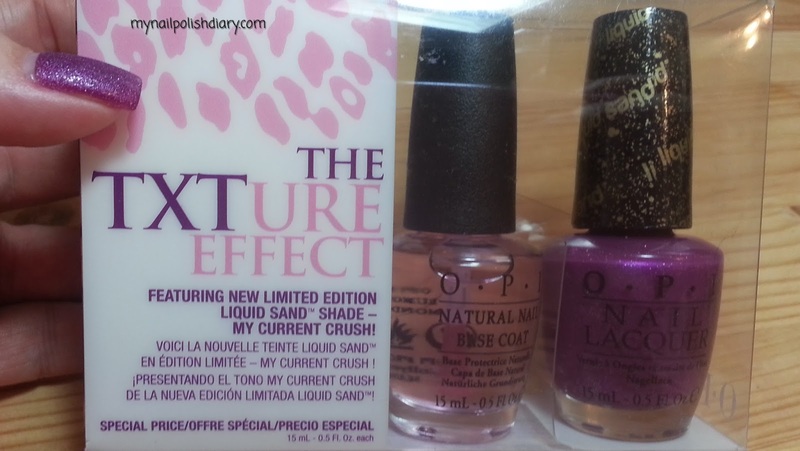 OPI If You Moust You Moust was released in the Vintage Minnie Mouse Collection summer 2012. I adore Minnie Mouse, so these last two MM collections have been so fun for me to buy and wear. Today's mani is true Minnie Mouse red. OPI Innie Minnie Mightie Bow is from the Coututre de Minnie collection released this past summer. 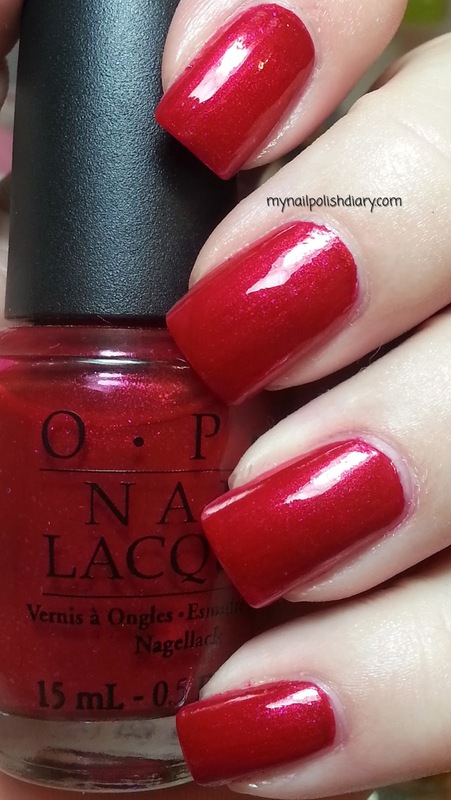 OPI Innie Minnie Mightie Bow is a shimmery cherry red. Minnie is all about red and this shade is so fitting for her. It's also pretty darn good for me! Application was good though the formula was a little thin. Wear time was great. No complaints from me on this beauty. 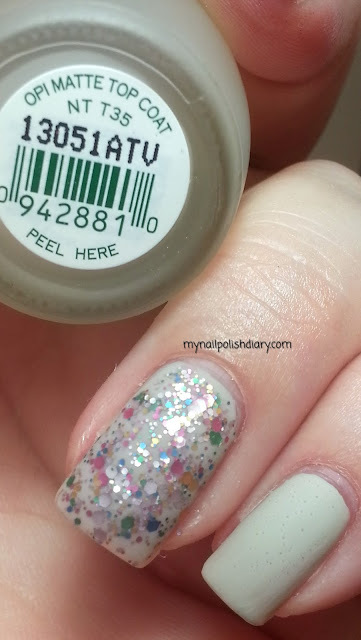 OPI Congeniality Is My Middle name is from the Miss Universe collection released summer 2011. OPI Congeniality Is My Middle Name is a berry colored jelly base with pink and purple glitter. It's uber pretty! I didn't have any problems with application, formula or wear time. It's one of those kinda differently weird polishes that are fun to wear. The glitter is more noticeable in the sunlight and kind of subtle inside. Zoya Tosca is part of their classic collection. I don't really know when it was released. It's lovely. Application and wear are great. 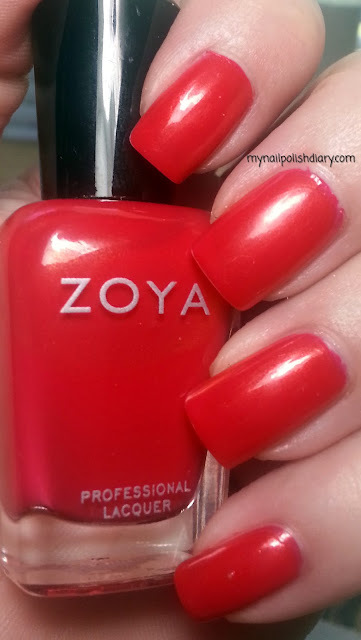 As always, Zoya does not disappoint. 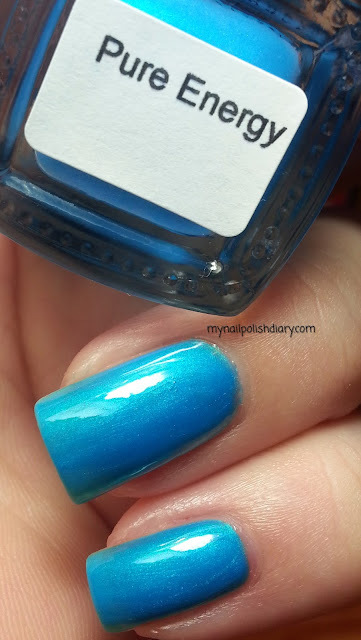 China Glaze C-C-Courage was originally released in 2001. In the winter of 2009 they released Wizard of Ooh Ahz Returns! to coincide with the 70th anniversary of The Wizard of Oz movie. The colors are nearly identical to the original release. I have the collection from 2009, and so these swatches are from the re-released collection. 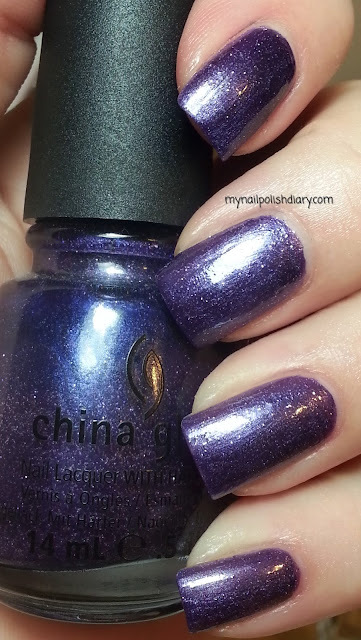 Chine Glaze C-C-Courage is a blueish purple that's kind of frosty and has silver micro glitter.This is an interesting polish. I don't wear it a lot. Obviously it's dated. And China Glaze was amazing to release this collection again for the fans. It's one of my "collector" sets. So, in that respect, I love it and I'm glad to have it. Application was not bad and dry time was average. Wear is time fine as well. 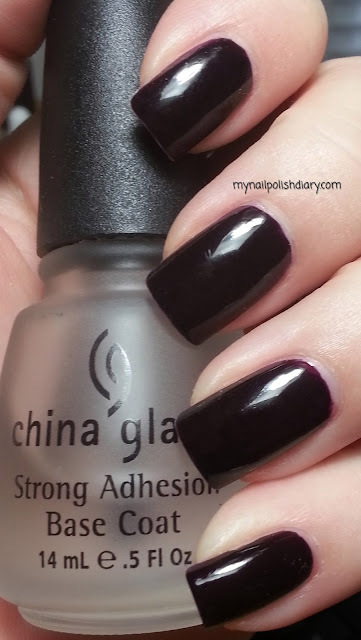 Chine Glaze Crimson is a blackened red creme. It looks brown in some lighting and black in other. Outside in the sun the red is more visable. All in all this is a stunning polish. I seriously can't stop looking at my nails. Call me vain I do not care! My hands looks freakin awesome. This color is perfect for fall. Which is obviously why China Glaze released it in a Halloween collection. I can go on enough about the beauty of this color. Application was a little tricky for me. The polish was very thin, and while it doesn't stain bad, it does stain a little. I was trying to be careful while applying the polish, and it runs a little. So it took me double time. Clean up wasn't super bad. But I was very careful and really the only problems I had was with it running into my cuticles. Wear has been great. And I think the extra time it took for application is well worth it. OPI Skull & Glossbones with OPI More Than A Glimmer mattified! So I can't say that I love this, but I think it's an improvement from the bubbly mess of yesterday. The accent nail with OPI More Than A Glimmer looks fantastic though.I used OPI Matte Top Coat and I have to say it is really good. It mattified perfectly. Smooth and even in one thin coat. I don't have another matte top coat that looks this good and goes on so smoothly. Highly recommend the OPI Matte Top Coat. I've had this one for ages and this is the first time I've used it. No idea why I wait so long to try a polish sometimes, but it's a shame I waited so long on this one. OPI Skull & Glossbones with OPI More Than A Glimmer for the accent nail. Skull & Glossbones was released in the 2011 Pirates of the Caribbean On Stranger Tides collection. I was so happy with this mani and so excited. Then it started drying...then the bubbles. UGH!! The bubbles. I don't think I've ever had so many bubbles in a mani. I didn't change my mani routine at all, so I have no idea why so many bubbles. Even with the bubbles though it's pretty. Skull & Glossbones is a light grey with green undertones. It's a great color. The application was weird. It went on showing brush lines and took 3 coats until the brush lines were not showing. It looked like as the brush applied the polish it also raked some off so there were bare lines in the first two coats. I wonder if there is something off in the formula of the bottle I have. Maybe that's why all the bubbles. I'll do a test mani with it and see if it happens again at some point. The OPI San Francisco collection is one I knew I would buy the entire collection because of the name. I love San Francisco and miss living there SO MUCH! The weather was my favorite of anywhere I've ever lived. So, I ordered the entire collection the minute I could. Some collections I just like to have the cardboard stand and this was definitely one of them. Finding out there were three Liquid Sands including the 12 regular colors was awesome. 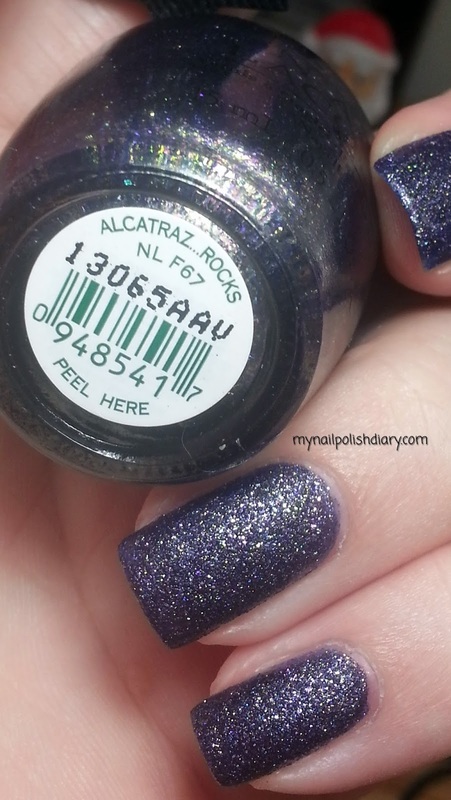 The first Liquid Sand I tried from the collection was Alcatraz Rocks. 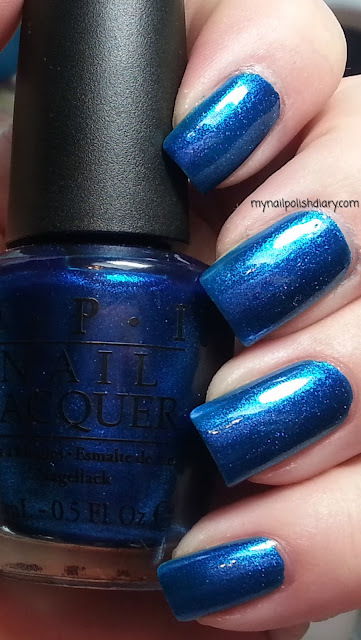 OPI Alcatraz Rocks is a navy blue-ish purple with multiple colors of glitter. The most noticeable colors of shimmer were gold and pink but there's also silver and orange and just too many for my eyes to absorb. It's fabulous. I am totally in love. The application was flawless! It dried pretty quick. I gave it 45 minutes but I'm pretty sure 30 would have been enough. I just err on the side of caution when drying the texture polishes. 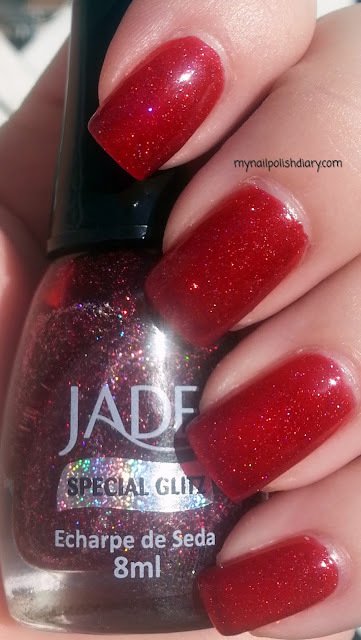 Jade polish is such a great brand. They have wonderful formula and for me, they last a really long time on the nail. I just bought the entire Special Glitz collection. I wore Echarpe de Seda first. Both Ninja Polish and Llarowe sell it for $6. Jade Echarpe de Seda is from the Special Glitz collection that I think was released this summer. I just ordered it a couple weeks ago and was in a hurry to try them out! 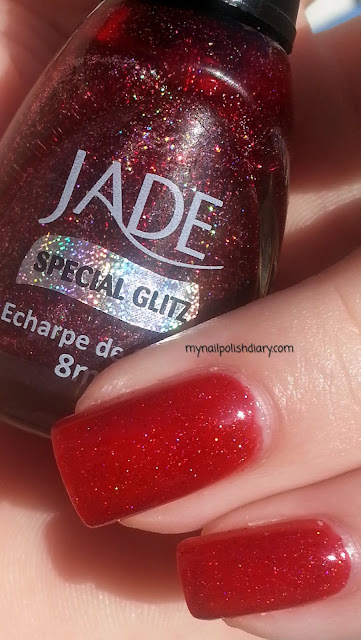 Echarpe de Seda is a cherry red with holographic glitter. It's not chunky at all. It's similar to the holiday collection holographics Zoya put out last year. I haven't compared the colors, so I don't know if there are dupes yet. Application was smooth and easy. I used two coats with SV as my top coat. I'm no sure if the SV dulled any holo effect. I didn't have time to wait for it to dry so I had to take the chance. I am pleased with the results! I love textured polish! I was surprised to see this on my last visit to my beauty supply house. 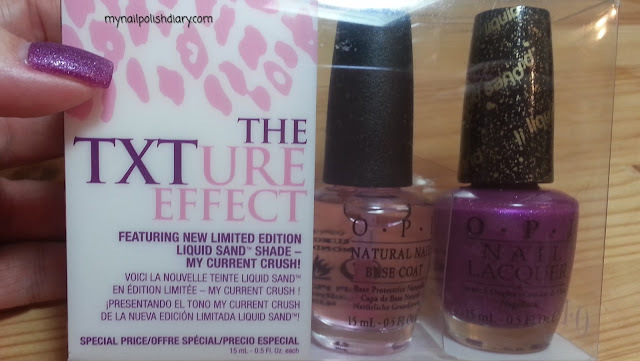 It was packaged in a duo with OPI Natural Base Coat and called The TXTure Effect. Directions say apply base coat and two coats of color. I thought you weren't supposed to use base coat for the best texture effect? I dunno. I always use my treatment and China Glaze Strong Adhesion. I cannot bear to apply any color directly to my nails. Evar! I haven't seen any ads or promo for this at all. Maybe I just missed it. I have been extra busy lately. At any rate, I'm glad I saw it. I couldn't wait to try it out! 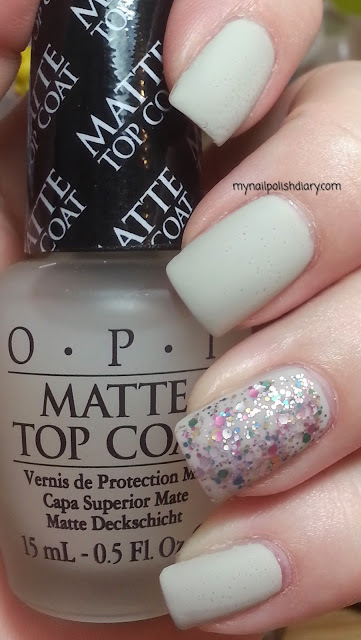 OPI My Current Crush is a gorgeous liquid sand, OPI's version of textured polish. It's a royal purple with just enough silver and purple micro glitter to make it sparkle just right as the light hits it.So pretty! It's not quite as textured as the other liquid sand polishes I have. That's not a bad thing. It's just as awesome as the other liquid sands I have and I love it. The application was absolutely perfect. Maybe the best ever. Maybe I was having a lucky application. I don't know. But I only had to use my clean up brush on two nails. I love that! I did two coats and let it dry a good 45 minutes. I think it was dry sooner than that but I was not gonna take a chance and mess up such a gorgeous and easy application. Here's hoping future application go as flawlessly.